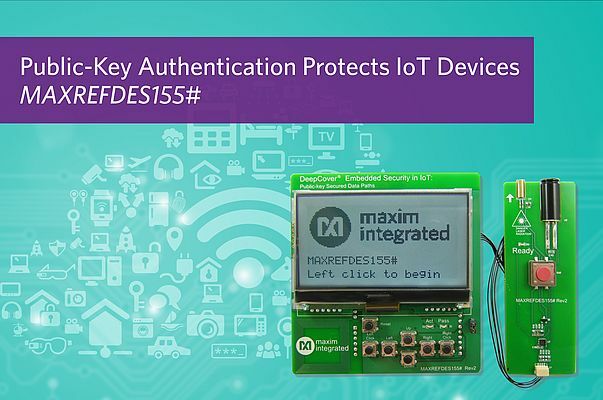 Designing in crypto-strong authentication to protect Internet of Things (IoT) device hardware, plus providing authenticity and integrity of small data transactions between the device and the cloud, is now easier and quicker with the MAXREFDES155# DeepCover® embedded security reference design from Maxim Integrated Products. The MAXREFDES155# platform includes an Arduino® form factor ARM mbed shield module and attached sensor endpoint. The shield contains a DS2476 DeepCover ECDSA/SHA-2 coprocessor, LCD, push-button controls, status LEDs and Wi-Fi® communication. The sensor endpoint contains a DS28C36 DeepCover ECDSA/SHA-2 authenticator, IR thermal sensor, and aiming laser for the IR sensor. The reference design is equipped with a standard shield connector for immediate testing using an mbed board such as the MAX32600MBED#—the combination of these two devices represents an IoT node.